At first glance the painting felt rather dark and severe. I’m not religious, so the subject matter wasn’t something I would normally be drawn to. However, I’d been told that this particular painting had an interesting past and I was keen to discover its story. I stood and looked at the painting; it gazed back at me. We began to develop an understanding. I felt that I needed to give this painting a voice. If it could speak, what would it say? Was it yearning for recognition? Did it feel neglected, or was it content to watch the world go by – or at least the visitors? I thought about how much it must have seen and heard over the years, both when it hung in the chapel and more recently, in its current position overlooking the staircase of the Foundling Museum. I started to do more research into the painting’s history. Unlike some of the other works of art that were created especially for the Foundling Hospital, this painting was originally commissioned by Thomas Macklin for his illustrated Bible. Published in several volumes, Macklin’s Bible cost a small fortune to produce. Subscribers included the Royal Family and several prominent members of society; it would have been well-known in its day. After Macklin’s death, the painting was purchased by four of the Foundling Hospital’s governors. It had been rather neglected and had to be almost entirely repainted before it could be hung in the chapel. I imagined it developing relationships with the foundlings. It listened to their whispered hopes and dreams and watched over them as they grew up. I came to think of it as a benevolent presence; it would miss the children when they were old enough to leave. 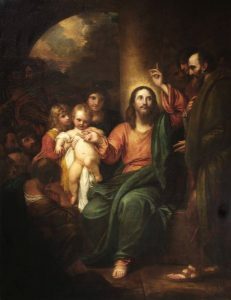 The subject matter of the painting also seemed to sit well with this interpretation: it depicts Christ as a father figure who looks after all little children. It felt right to think of it as a kind of guardian of all those who enter the space it inhabits. I’d found out that some of the former foundlings returned to visit as adults. Would the painting recognise those who came back? Would the foundlings remember it fondly? I imagined a look of recognition passing between them, accompanied by a wistful smile and a shared remembrance of times past. As I listened to the painting, I discovered it had a lot to say. I struggled to condense everything I wanted to convey into a mere 62 words. I’d decided to begin with a nod to the painting’s early years, then move on to the relationship it developed with the foundlings. I had to cut out the lines I’d written about the painting’s encounters with the foundlings who returned as I felt the piece needed a link to the present. The visitors to the Foundling Museum are important: they enable its stories to be kept alive, to go out into the world as the children did. I also wanted to explore the painting’s connection with the visitors, but the word count curtailed this. From where it hangs above the staircase, the painting hears the conversations of all the visitors and museum staff. I couldn’t help wondering what it might think of them – people from all over the world, talking in a mix of languages, wearing odd clothes and carrying cameras and mobile phones. People who are so different from those it encountered in its early days. Like the foundlings, this painting deserves to have its story told. I hope that my sestude will encourage people to look again, as I did, and develop their own relationship with ‘The Watcher in the Wings’. I was revered in my youth. a celebrity of the era. listened to their hopes and dreams. I look after the visitors now. of the children in the chapel.